A young wakagashira (underboss) of a Yakuza group, Tsunaike harbored ambitions to eventually become the leader of all crime syndicates of Asia. His plan to do this involved igniting a gang war between the Yakuza and the 108 Dragons. 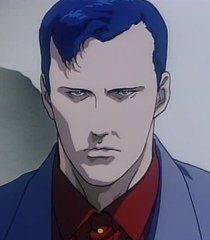 After both groups are sufficiently weakened, Tsunaike would move in to take over their operations with the help of his contacts in the Russian Connection, a Russian mafia organization. He also decided that Freeman would be major obstacle to his dreams for power and vowed to kill him. Tsunaike is assisted in his efforts by Tanya, a beautiful Russian assassin who is also his lover. Attacking both Yakuza and members of the 108 Dragons, Tsunaike gradually became bolder and he eventually set a trap for Freeman. However, he and Tanya severely underestimate Freeman's abilities as an assassin and both are killed.